For dry or extra dry skin. 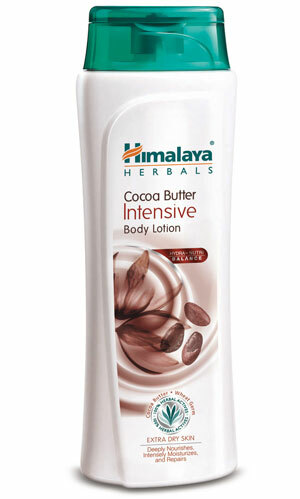 Himalaya Herbals Cocoa Butter Intensive Body Lotion deeply moisturizes, repairs and nourishes skin. It is a daily-use, intense moisturizer, with a luxurious blend of nourishing and deep-penetrating natural ingredients that help repair, nourish, soften and smoothen dry skin. Cocoa Butter intensely moisturizes, softens and improves skin texture, and Wheat Germ Oil, a rich source of natural Vitamin E, nourishes and boosts the skin’s elasticity. Olive Oil and Grape Seed Oil help in repair and regeneration, restoring healthy skin with a long-lasting glow. Apply Himalaya Herbals Cocoa Butter Intensive Body Lotion gently all over the body, with special attention to severely dry areas, slowly massaging it in. Best used after bathing when your skin is most receptive to hydration.